2012 was a pretty crazy year for us. I turned 30, we took some fun trips, went to some excellent restaurants, moved to a new house, and most crazily, found out we are expecting twin boys (any day now!!)!! 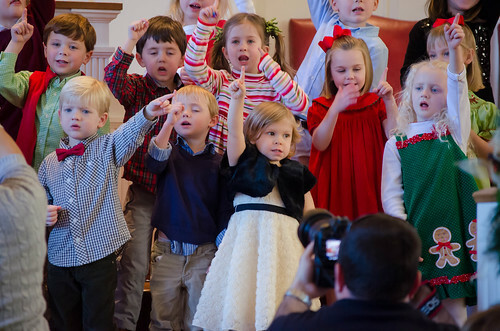 I hope 2013 is maybe a little less crazy, though with 4 kids under 5 in the house, somehow I doubt that it will be. I definitely had my ups and downs this year when it came to eating and blogging, but through it all, I hope I've brought you some delicious food and somewhat entertaining writing. I struggled a bit when it came to compiling my favorites of the year. I had a few months where I couldn't really eat anything thanks to morning sickness, and my appetite is kind of weird right now thanks to my tic-tac sized stomach and horrific heartburn. But these are the recipes that really stood out throughout the year for us. I hope you all have a very festive and safe New Year's, and I look forward to sharing more joy, craziness, and deliciousness in 2013! This Chicken and Sausage Stew was a family favorite. It's easy to throw together, is relatively healthy, super hearty and comforting, and the leftovers are pretty killer too. A definite win all-around. Sweet Potato and Black Bean Quinoa was kind of a surprise hit, but it's quick, super healthy, and again - the leftovers are awesome. 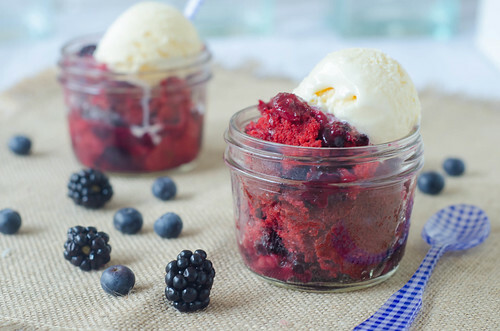 Red Velvet Berry Cobbler, however, was not a surprise hit. I knew we'd love it, and of course we did. It's really more a summer dish thanks to the loads of fresh berries, but I think you could make it using frozen berries that have been drained really well. Valentine's Day dessert, anyone? 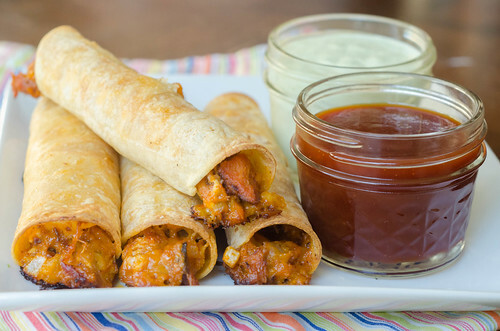 Baked BBQ Pork Taquitos were a play on the infamous chicken taquitos, and a quite successful one at that. We always have pulled pork in the freezer, so I'm always looking for fun and different ways to utilize it. They also use my favorite homemade bbq sauce and ranch dressing. Even more reason to love these! We made a meal out of this Grilled Halloumi with Grape Relish several times this spring and summer. 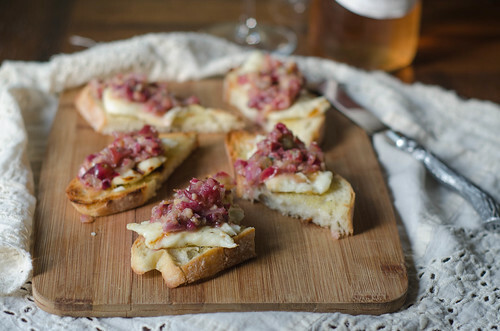 A platter of this, some fruit and charcuterie, and a bottle of wine are all you need for a date night at home. 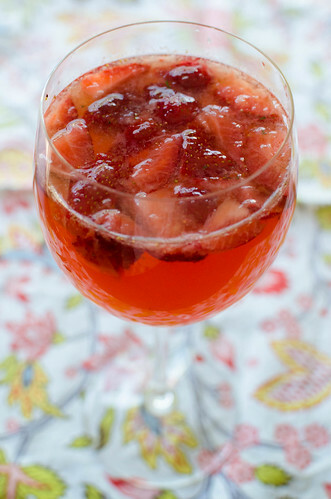 This may just be a case of wanting what I can't have, but a glass of this strawberry-rose' sangria would be so perfect right now. I'm also already longing for spring and warm weather, so that may also have something to do with it. Either way, when I brought this to a party, every single person asked me for the recipe. 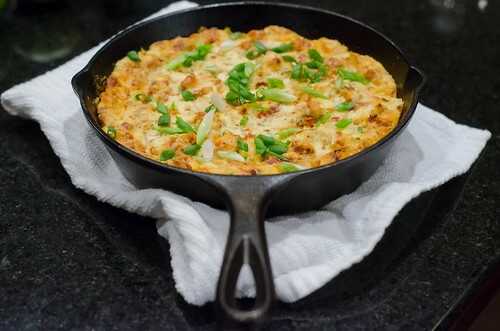 It's definitely easy to see why I loved the Goat Cheese Potato Gratin. It's a potato gratin. With goat cheese. So decadent and delicious. I highly recommend that you find some way to make this. Sooner rather than later. 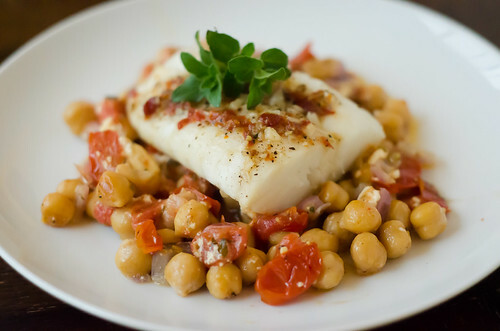 This Foil-Baked Fish with Feta, Chickpeas, and Roasted Tomatoes was a remix on the ever-popular foil-baked fish with black beans and corn. Same method, totally different flavor profile. But it was really great - I had honestly forgotten about it, but now I'm adding it to my menu for next week. Just like the skillet lasagna, these Lasagna-Stuffed Portabellos are kind of a deconstructed lasagna. We all really loved these, and I definitely plan to make them again soon (and hopefully get a better picture -eek!). I made a lot of burgers this year, but these Mushroom-Crusted Turkey Burgers might be my favorite. 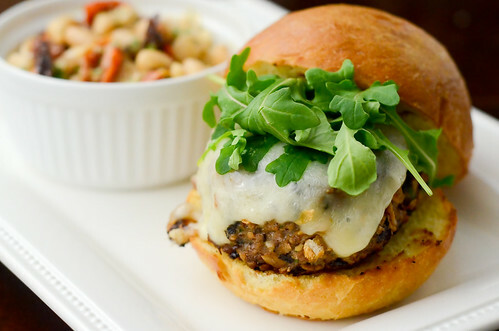 A great weeknight meal that's a little different than a run-of-the-mill turkey burger. 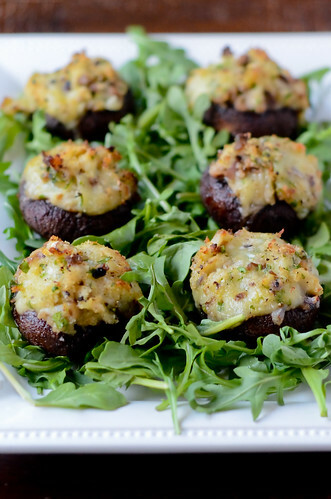 Mushrooms + Havarti cheese definitely put these in another league. 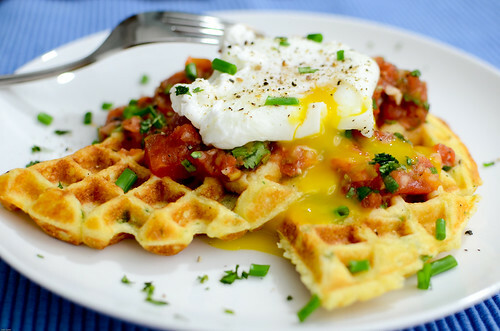 These Cornmeal-Herb Waffles with Salsa and Poached Eggs are definitely something to make soon. They'd make a great New Year's Day brunch. I'm including them not only because we loved this meal so much, but also because they opened up the floodgates when it came to poached eggs. 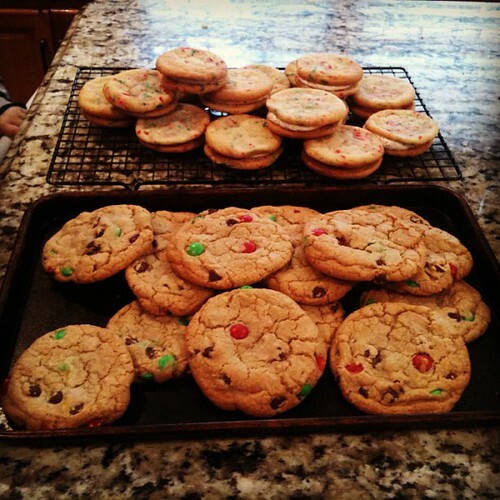 It was my first attempt at making them at home, and I haven't stopped since. 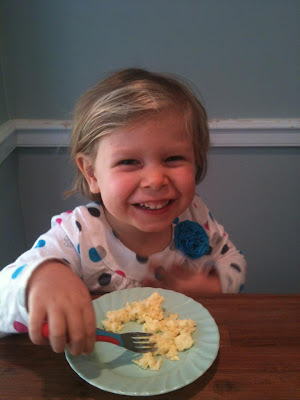 Now that Caroline has outgrown her egg allergy, I foresee several omelets baked in bread boules in our near future. This one was a kale and bacon omelet, and it was the first time that Joey admitted to liking kale. While I loved this combo, I can't wait to experiment with some other variations and ideas. And yet again, the leftovers are great - a wedge of this makes a great breakfast the next day! Mocha-Frosted Espresso Brownies did nothing to slow down my coffee addiction. 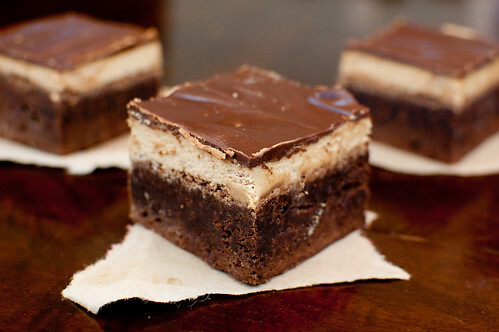 You have an espresso-laced brownie, coffee buttercream, and espresso ganache. They are goooood. So that's it! My favorite recipes of the year. Thanks again to all of you wonderful people for reading and inspiring me. Here's to a great 2013! Another year, another round-up. In keeping with Pink Parsley tradition, I'll be posting the most popular recipes of the year, along with my personal favorites. According to Google Analytics, here are the most viewed posts of the year. And without a doubt, this was the year of comfort food and salted caramel. 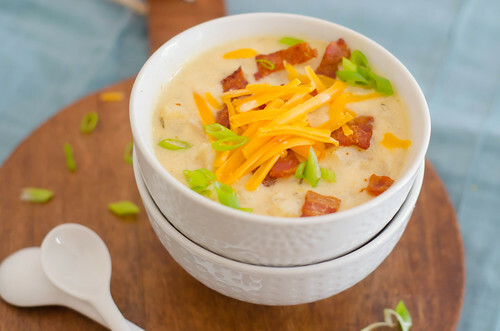 Loaded Baked Potato Soup from the slow cooker. Potatoes, cheese, bacon... what's not to love here? Especially if the crockpot does all the work for you! 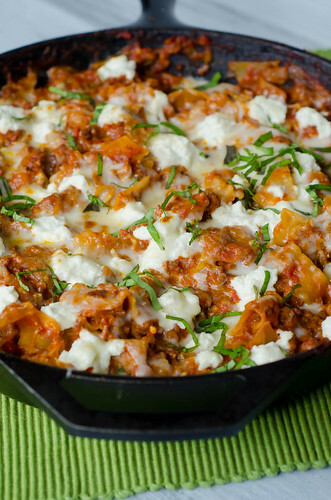 Skillet Lasagna. A deconstructed lasagna that's ready in about half an hour. Ultimate comfort food. 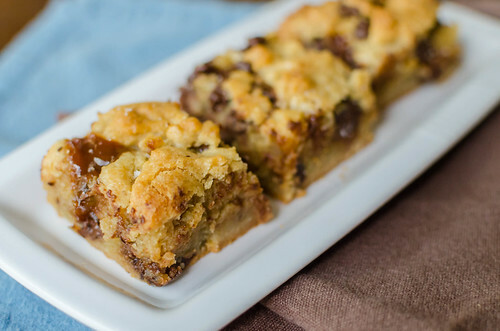 Salted Caramel Chocolate Chip Cookie Bars. What's not to love here? Cheesy Baked Pasta with Roasted Red Pepper Sauce and Eggplant. 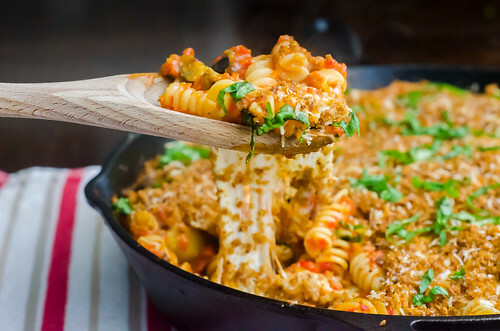 It's full of all sorts of deliciousness: eggplant, roasted red peppers, pasta, cheese, and crunchy breadcrumbs. Salted Caramel Cheesecake Cupcakes. 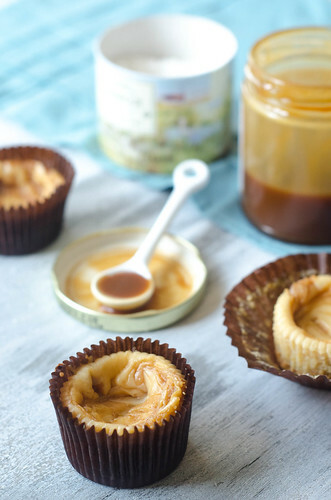 Cupcake-sized cheesecakes, swirled with salted caramel sauce. Another dish that would make a great addition to a New Year's party. Salted Caramel Brownies. Seriously, I told you it was the year of salted caramel. 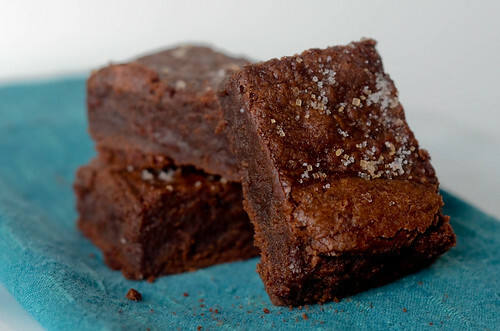 These are Joey's favorite brownies, and for good reason. Super chocolately, with a salted caramel filling. 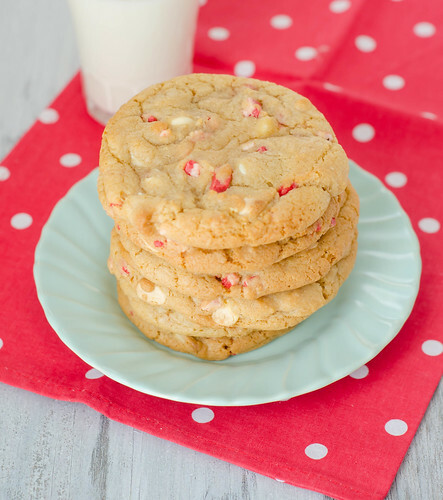 A sprinkling of fleur de sel totally makes them too. 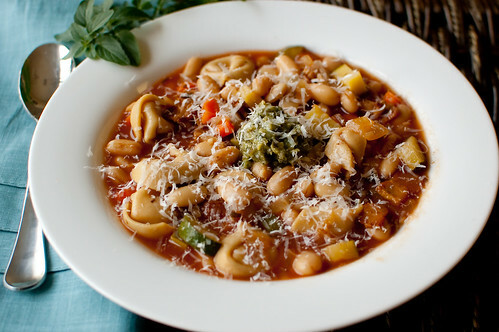 Tortellini Minestrone. 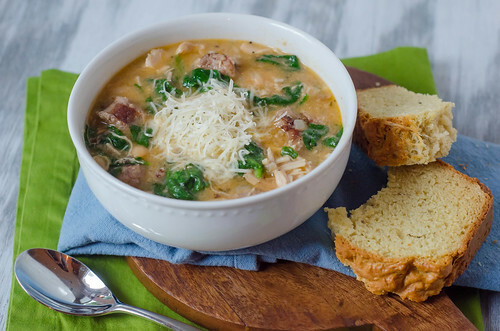 A comforting soup that's still pretty light and healthy. 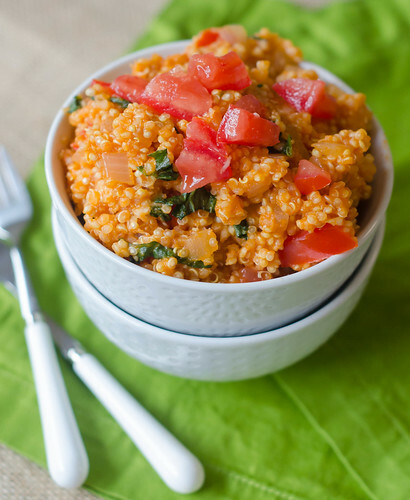 Tomato-Basil Quinoa. I threw this dinner together in a pinch one night, but it was one of my favorite dinners (and subsequent lunches) of the summer. 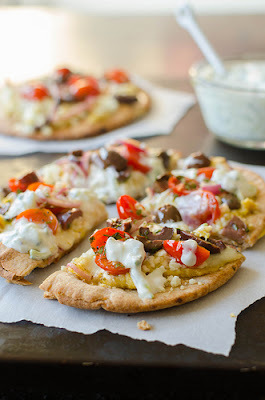 Greek Pita Pizzas. 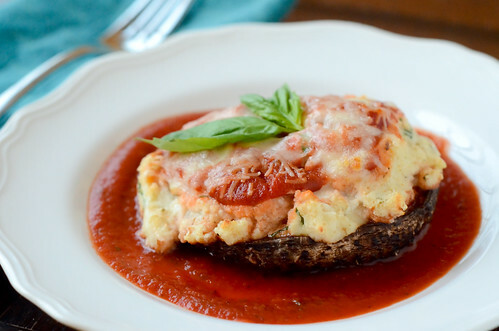 Another healthy dinner or lunch option. I've made this (or a variation thereof) several times, and it's by far one of my favorite meals. Pita bread, hummus, cheese, tzatziki.... all good things! 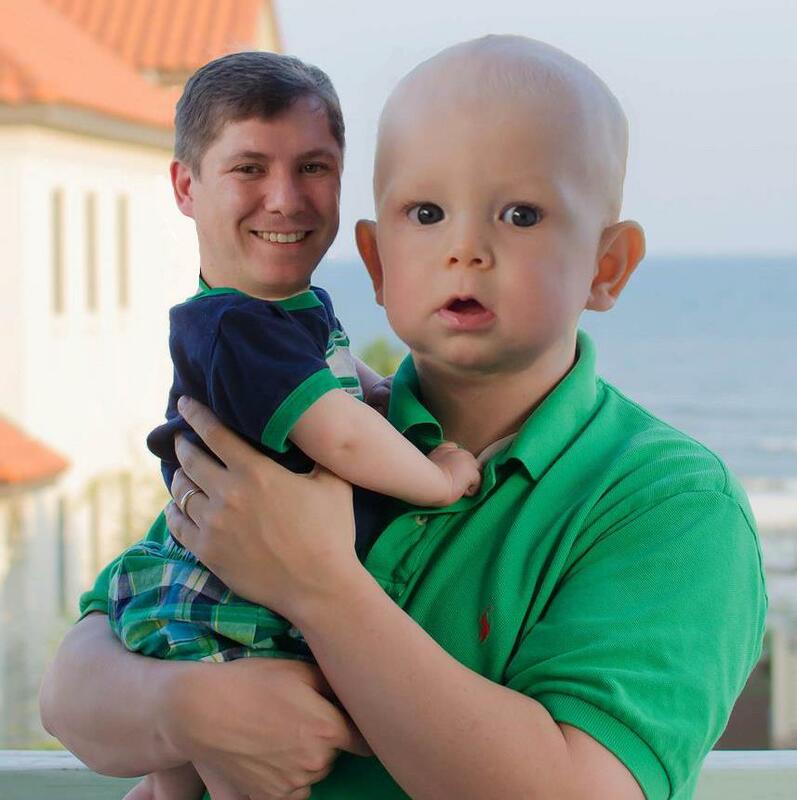 Thanks for reading, and I'll be back tomorrow with my personal favorites of the year! While I haven't been at my most spry this Christmas season, we've still managed to fit in several fun holiday activities. I thought I'd share a few of our favorite pictures from the past few weeks. Thanks to you all for reading, and I hope you all have very merry Chrismtases with your loved ones. 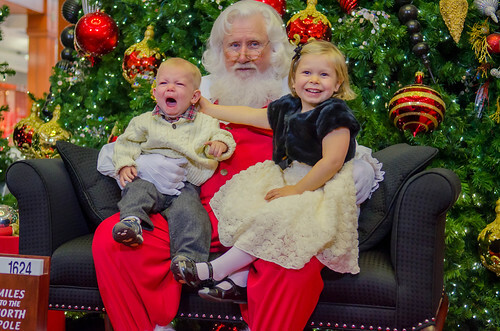 It wouldn't be Christmas without a visit to see Santa. Unfortunately, Smith was not a fan this year. I wonder how many crying kids we'll have sitting in his lap next year? 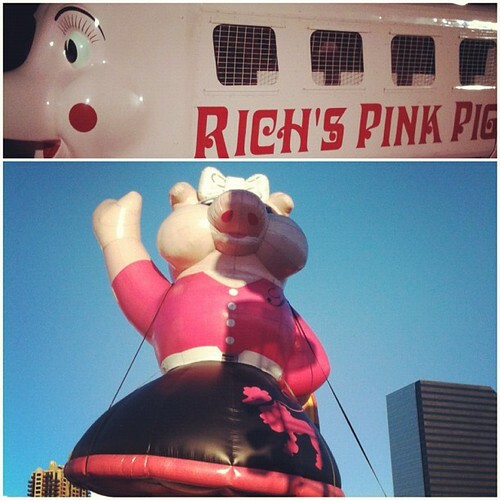 We followed it up with a visit to the famous Atlanta Christmas tradition, The Pink Pig. And Smith definitely enjoyed that. 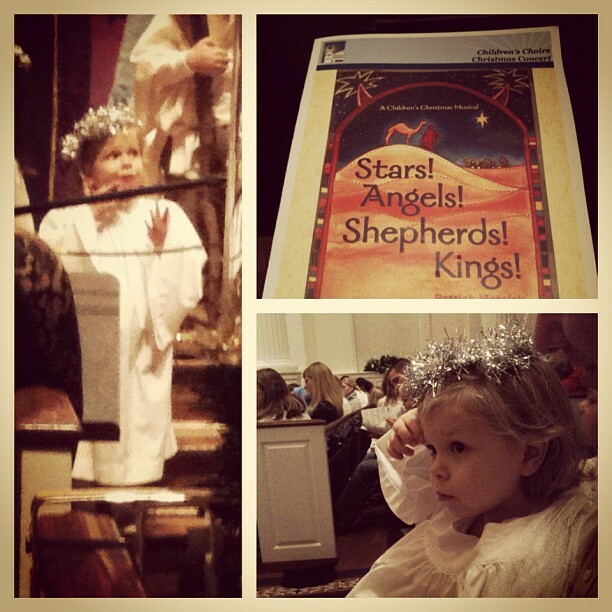 Caroline was an angel in the church Christmas program. I'm clearly quite biased, but I think my husband is pretty awesome. He's been especially awesome throughout this pregnancy. When I had an *ahem* minor freakout upon finding out we were expecting twins, he talked me down off the ledge. When I had multiple meltdowns about moving and finding the perfect house, he didn't lose his patience. When I'm too sick or tired or lazy to make dinner, he's okay with take-out or quesadillas. He gets up at the crack of dawn with Caroline and Smith every morning and lets me sleep until the last possible minute before he has to get ready for work. He does bath and bedtime completely on his own so I can relax and put my feet up at night. He washes all the dishes every night. And he doesn't get mad at me when I yell at him for doing things like breathing too loud. So with all that said, I wanted to make him a totally awesome birthday cake this year. I typically like to go all out and do something elaborate, but given my physical condition these days, I decided to keep it simple. He requested chocolate, and I immediately thought of this tunnel of fudge cake. I've had it bookmarked for over three years, and had somehow forgotten about it. Lucky for me, Annie posted it a few months ago, and I've been dying to make it ever since. So let's take a moment to talk about the amazingness that is this cake. 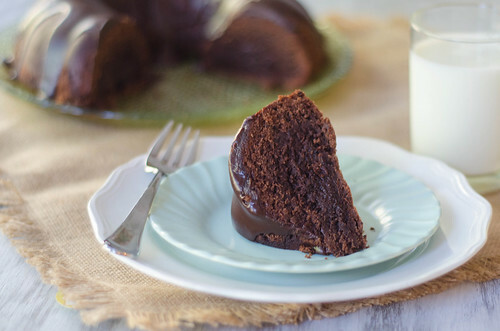 From the outside, it just looks like a standard chocolate bundt cake with a chocolate glaze. But then. You cut into it, and there's a tunnel of fudge. A tunnel. of. fudge. So you are basically left with kind of a molten lava cake in bundt cake form. The cake itself is moist and tender, but then the magical chocolate center is a cross between pudding, fudge, brownie batter, and cake. I don't really know what else to say about that. Or what else you need to know. To make the cake, preheat the oven to 350 degrees and adjust the oven rack to the lower-middle position. Grease a 12-cup bundt pan with butter and dust with cocoa powder. Pour the boiling water over the chopped chocolate in a medium heatproof bowl, and whisk until smooth. Cool to room temperature. Meanwhile, whisk the cocoa, flour, confectioners' sugar, and salt in a large bow. Beat the eggs and vanilla in a large measuring cup. In the bowl of a stand mixer fitted with the paddle attachment, cream the butter, granulated sugar, and brown sugar on medium-high speed until light and fluffy, 1-2 minutes. Lower the speed to low and add the egg mixture until combined, about 30 seconds. Add the chocolate mixture and beat until incorporated. Beat in the flour mixture just until combined, about 30 seconds. Scrape the batter into the prepared pan, smooth the top with a spatula, and bake until the edges are beginning to pull away from the pan, about 45 minutes. Remove from oven and cool (in the pan) on a wire rack for about 1 1/2 hours, then invert onto a serving plate and cool completely, at least 2 hours. To make the glaze, heat the cream, corn syrup, and chocolate in a small saucepan until smooth, stirring occasionally. Remove from heat and stir in the vanilla. Allow to sit about 30 minutes, until slightly thickened. Drizzle the glaze over the cake and set for at least 10 minutes before serving. I don't know why or how, but for some reason I seem to have developed a mental block against making lasagna. Don't get me wrong - it's one of my favorite foods - but for some unknown reason, I just really hate making it. So I've had this recipe for butternut squash lasagna with goat cheese saved for about a year, but could never work up the motivation to actually make it. A few weeks ago, however, I couldn't get it out of my head, so I decided to convert it to a recipe for stuffed shells. 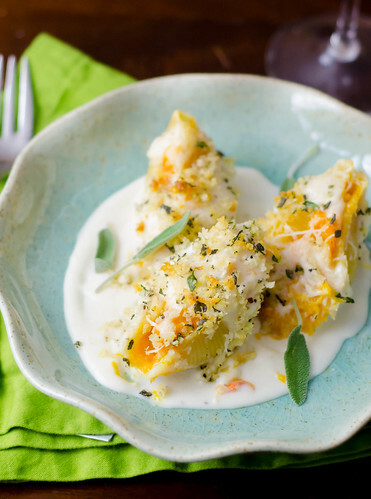 So here's what we have going on in these shells: butternut squash is roasted with some garlic and herbs, then the flesh is scooped out (along with the sweet and delicious roasted garlic), and mixed with fresh herbs and a white sauce that's infused with goat cheese, Pecorino cheese, and sage. That mixture is then stuffed into shells, topped with more of the goat cheese sauce, and then breadcrumbs mixed with butter, more cheese, and fresh herbs are sprinkled over the whole thing before it's baked. I shouldn't even have to say this, but of course the shells were totally delicious. It's hard to go wrong with those ingredients though. In my opinion, the breadcrumb topping were what put it over the top. 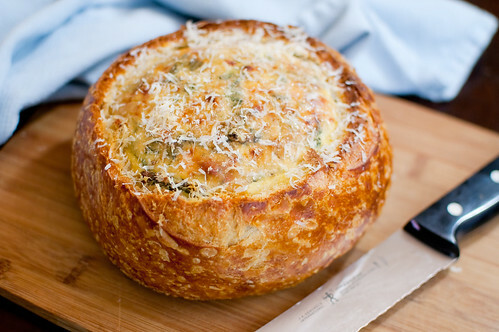 The crispy, buttery breadcrumbs mixed with fresh sage, parsley, and thyme just did it for me. It added some much needed texture, since the filling and the shells were soft, and it also provided a great savory contrast to the filling of the shells - sometimes dishes with butternut squash can be too sweet, and the breadcrumbs helped counteract the sweetness. I made the full recipe as written below, and froze half the shells for a nice meal once the babies are born. I also think this would be a great idea for a nontraditional Christmas dinner - it's kind of fancy, seasonally appropriate, decadent, can be assembled ahead of time, and most importantly, super tasty of course! Preheat the oven to 425 degrees. Place the squash flesh side-up and place 1-2 garlic cloves and a sprig of thyme in the empty cavity of each half. Brush with the olive oil, and sprinkle generously with salt and pepper. Cook until the flesh is easily pierced by a fork and beginning to brown and blister, 45 to 50 minutes. Remove from oven and allow to cool. Discard the thyme sprigs. Put the garlic in a large bowl. Scoop the squash flesh from the skins and add it to the garlic. 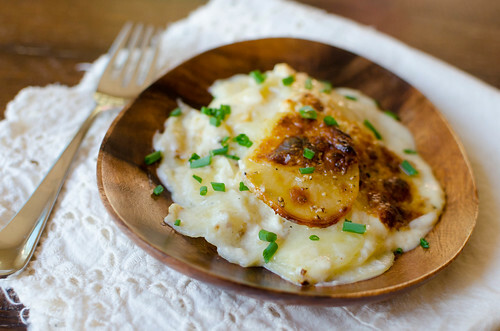 Mash with a fork until smooth, stir in 1 teaspoon each of the sage and thyme, and 1/2 cup of the Pecorino. Add salt and pepper taste, and and set aside. Meanwhile, make the goat cheese-sage sauce. Melt 4 tablespoons of the butter in a medium saucepan over medium heat. Add the sage sprigs and cook until the butter is fragrant, 2 to 3 minutes. Add the flour and whisk until smooth and golden, about 2 minutes. Gradually whisk in the milk and cook, whisking occasionally, until thickened enough to coat the back of a spoon, about 15 minutes. Fish out the sage sprig and discard. Stir in the goat cheese, 1/2 cup of the pecorino, the nutmeg, 1 teaspoon of salt, and a few grinds of pepper. Season to taste with more salt and pepper if needed. Mix 3/4 cup of the sauce into the butternut squash, then set the rest aside. season with additional salt and pepper as needed. To make the seasoned breadcrumbs, melt the remaining 2 tablespoons of butter. In a small bowl, mix the breadcrumbs, chopped sage, chopped thyme, the remaining 1/2 cup of Pecorino cheese, a pinch of salt, and few grinds of pepper. Add the melted butter and mix well with a fork. To assemble the shells, lightly grease a 9x13 inch baking dish. Spread 1/2 cup of the reserved goat cheese sauce over the bottom of the dish. Stuff each shell with the butternut squash mixture, then arrange in a single layer in the prepared baking dish. Pour 1 1/2 cups of the cheese sauce over the shells, then sprinkle with the breadcrumbs. Cover the dish with foil and bake 25-30 minutes. Remove the foil and bake an additional 10-15 minutes, or until the breadcrumbs are browned and the sauce is bubbly. Remove from oven and serve, passing the remaining goat cheese sauce at the table. When it comes to making it yourself, chicken stock is one of those things that you may be tempted to say "why bother?" It's pretty cheap to buy, and the store-bought version is fine to use in most capacities. However, once you make your own, you'll definitely see the difference. 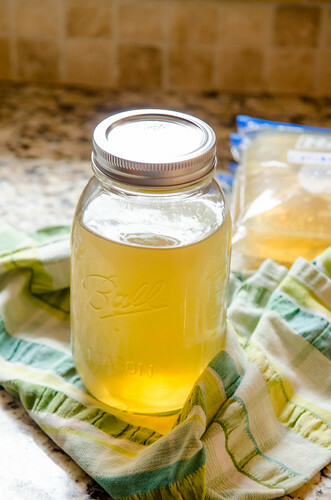 Homemade stock is rich and flavorful. And what's even better - it's practically free to make. Here's my M.O. Whenever I roast a chicken or buy a rotisserie chicken, I pick all the meat and skin off, put the carcass in a big ziploc bag, and throw it in the freezer. I also save any scraps of veggies and throw them in the freezer as well - bits of carrot, that half of an onion that I didn't need, celery that's on it's last leg... you get the picture. I usually wait to make the stock until I have two chicken carcasses. Just to get more bang for my buck. This is literally SO easy - I just start the crockpot at night, then the next morning, it's done. I transfer the dish to the refrigerator, then that evening I skim the fat off, divide it into 2-cup portions, and freeze. I have enough chicken stock to last several weeks-months. And by the time I deplete my stash, I usually have two more chicken carcasses in the freezer to use. So not only are you saving money by not buying box after box of chicken broth, you end up with a far superior product, and you're being environmentally conscious - reusing the chicken carcass, saving yourself from throwing out past-its-prime produce, and saving on trash - no paper boxes or cans to throw away. Win, win, win. small handful of fresh herbs - parsley, thyme, oregano, etc. Place all the ingredients in a slow cooker. Cover with just enough water to submerge the chicken by 1-2 inches. Cook on low 12-13 hours. The longer it cooks, the deeper the flavor. Transfer the bowl of the slow cooker to the refrigerator for several hours. Skim the fat off the top, then strain the liquid through a colander that's lined with a cheesecloth. Divide the stock into whatever sized portions you prefer and freeze in ziploc bags or quart containers. I like to divide mine into 2-cup portions, for what it's worth. 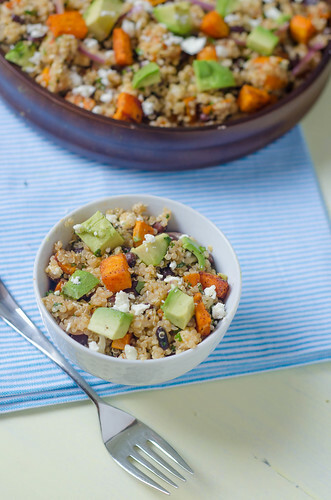 I first experienced the deliciousness that is sweet potato + black beans earlier this fall when I made this quinoa. Ever since then, I've been bookmarking recipes that use the combo - tacos, pizza, quesadillas, etc. These enchiladas were first up though, especially when I saw that they use salsa verde - my favorite salsa! They came together quite easily. I actually made the filling during Smith's nap time, then just assembled and baked them when Joey got home from work. The filling is pretty simple - sweet potatoes, a can of black beans, and a few simple seasonings. I also added some chopped Swiss chard, because I had it on hand and like to add extra greens whenever I can. It definitely added an extra heartiness to the finished product, not to mention giving them a big nutritional boost! I think spinach would work well too, or just leave the greens out if you don't like them. 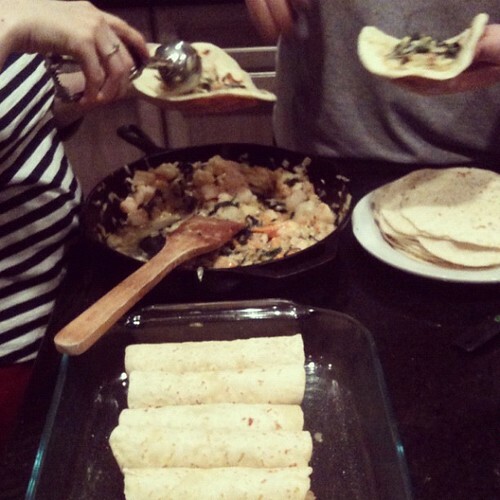 Also, feel free to use corn or flour tortillas - everyone has a preference. I actually made half of them with corn and half with whole wheat + flax seeds, and I like the flour better. I thought the tortillas were a bit sturdier and made the enchiladas feel a little more substantial. Preheat the oven to 350 degrees and lightly grease a 9x13 inch baking dish. Place the sweet potatoes in a large skillet and add enough water to just cover the potatoes. Cook over medium heat for about 10-15 minutes, until they are softened but not mushy. Transfer to a strainer and return the skillet to the heat. Add the oil, then the onions. Sauté until softened, stirring often. Add the garlic, cumin, chili powder, salt, and pepper, and cook until fragrant, abut 1 minute. Stir in the swiss chard, cilantro, and black beans, and cook, stirring constantly, until the chard wilts and the beans are heated through, 2-3 minutes. Gently stir in the cooked sweet potatoes and remove the skillet from heat and stir in about half the cheese. To assemble the enchiladas: Spread about 3/4 cup of the salsa verde on the bottom of the prepared baking dish. Wrap the tortillas in a damp paper towel and microwave about 30-60 seconds. Fill each tortilla with about 1/3 cup of the filling, and roll tightly. Place seam side-down in the baking dish, and repeat with the remaining tortillas and filling. Pour the remaining salsa verde over the top, then sprinkle with the remaining cheese. Bake about 20 minutes, or until the cheese is melted and bubbly and the filling is heated through. If the cheese browns too quickly, cover the dish with foil. 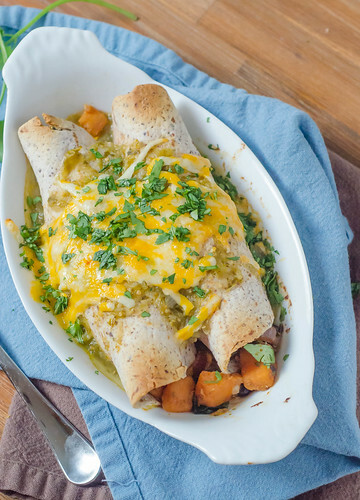 Sprinkle enchiladas with chopped cilantro and serve. A few months ago, we went though quite the ordeal with Caroline, but emerged on the other side with some absolutely fantastic news: She's outgrown her egg allergy!! After the skin tests and blood draws showed her to have a borderline allergy, the allergist issued her an "egg challenge." And yes, I had trouble not saying "Challenge - accepted." Basically they fed her one scrambled egg over the course of 3 hours and monitored her reaction. Or in this case, the lack there of. I know it sounds a little ridiculous, but I definitely shed a few tears of joy at the news. Especially when she even got a little teary-eyed as she told me how happy it made her to be able to eat eggs, cookies, cakes, and pie. To celebrate, I took her to the Whole Foods bakery and let her pick out anything she wanted from the dessert case. She went with a fruit tart filled with pastry cream, and it was definitely enjoyed. Along with scrambled eggs the next morning for breakfast. I've become so wired to only prepare dinners without eggs, that I feel like a whole new world has been opened up to me. Not only can I now make things that use eggs as binders, emulsifiers, etc, but breakfast for dinner has quickly become a dinner that we keep in heavy rotation. Frittatas, scrambled eggs, waffles, pancakes, and French toast are all pretty popular with both kids. French toast especially. Caroline quickly declared that it's her new favorite food, and Smith loves it as well. I of course love my French toast drenched in maple syrup, but both of my kids have been eating it sans syrup, and they don't seem to mind at all. It's plenty flavorful on it's own. I know it may seem a little silly to share a recipe for something that is so basic and simple, but this recipe really deserves to be shared. 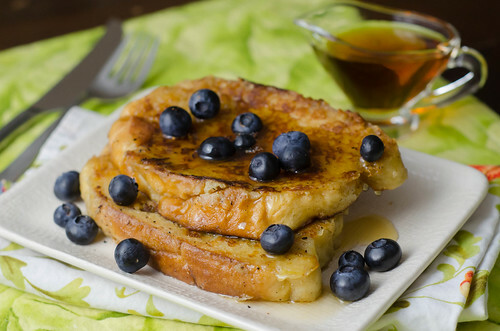 This is basically the ultimate French toast. The outside gets a nice crispy, buttery crust, with just the slightest hint of sweetness. The inside still remains light and fluffy - no soggy, limp French toast here! I've made this several times in the past month or so, and I foresee it being made even more as time goes on. I like to make a few extra pieces, then cut them into "sticks" and reheating them briefly in the oven the next morning. The flour in the soaking custard is what helps it form such a great crust. Also, using challah or brioche bread makes it feel that much more indulgent. I like to add a bit of orange zest to the custard as well, but it's definitely optional - I never make a special trip to the store or anything if I don't have one lying around. Heat a large skillet over medium heat for 5 minutes (preferably cast-iron, but nonstick will work as well). Meanwhile, whisk together the eggs and butter in a shallow dish or pie plate. Whisk in the milk, vanilla, brown sugar, orange zest, cinnamon, flour, and salt. Whisk until smooth. Soak the bread for about 30-40 seconds per side, being careful not to oversaturate the bread (in other words, no need to dunk it and press it down into the custard). Melt 1 tablespoon of butter in the hot skillet, swirling to cover the whole pan. Transfer the bread 2-3 slices at a time to the skillet. Cook until golden-brown, about 1-2 minutes on the first side, then 1 minute on the second. Continue with the remaining bread, adding 1 tablespoon of butter to the skillet for each new batch. Serve immediately. 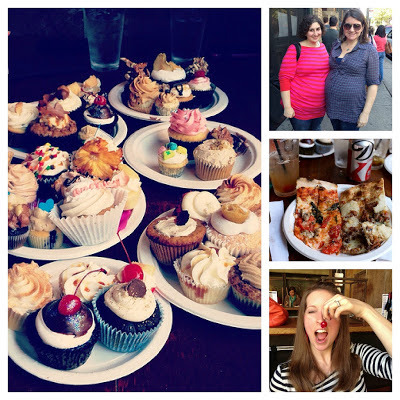 I feel like a broken record when I say this, but one of my favorite things about food blogging is the friendships I've made over the years. 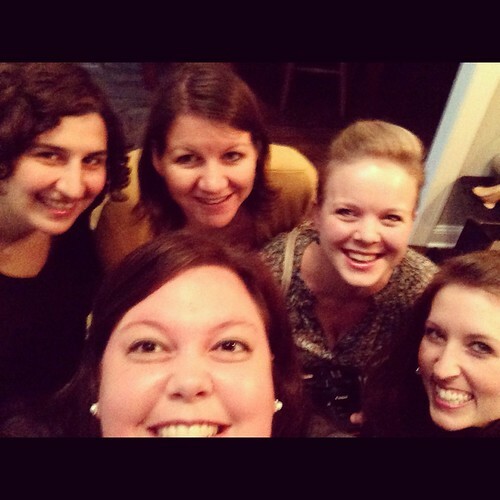 I have become especially close to a few fabulous food bloggers: Elly of Elly Says Opa, Courtney of Cook Like a Champion, Tara of Smells Like Home, and Annie from Annie's Eats. These girls really have become some of my closest friends. Without getting too sappy, I'll just say that over the past few years we've seen each other through some of the highest of highs and lowest of lows. Tara ever so graciously invited us all to spend a long weekend at her house in Connecticut, and what better time to visit New England than in the fall! I'll admit, I was a little worried about the weather - this southern girl doesn't do well with cold weather. But luckily, we ended up with an absolutely perfect weekend. Beautiful skies and gorgeous foliage and landscapes abound, every time we went anywhere I felt like we were driving through a postcard! Annie has become my travel buddy, so we hooked up in Atlanta and flew to Connecticut together. After a few delayed flights from all parties, we all finally made it to Connecticut! Tara picked us up from the airport, and after a quick stop for hamburgers and french fries, we arrived at her gorgeous house late that night. But we were so excited to be hanging out that although we were all super tired, we stayed up way too late talking and laughing. The next morning, after lounging in our pajamas, we headed out to a casual brunch at Leo's in Middlebury. After poring over the menu for what felt like hours, I settled on a potato pancake topped with ham, a poached egg, and hollandaise sauce. And since I can never decide between sweet and savory for breakfast, Elly and I ordered an extra waffle topped with pumpkin cannoli filling (yes, seriously) for the table to share. The rest of the afternoon was spent hanging out at Tara's - chatting, laughing, etc. And that evening, we headed out for a fun Halloween-themed outing. 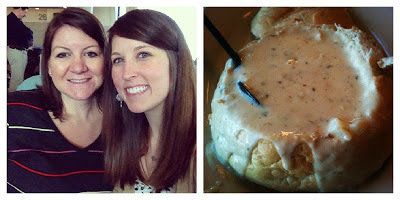 We first had a fabulous dinner at Taste. 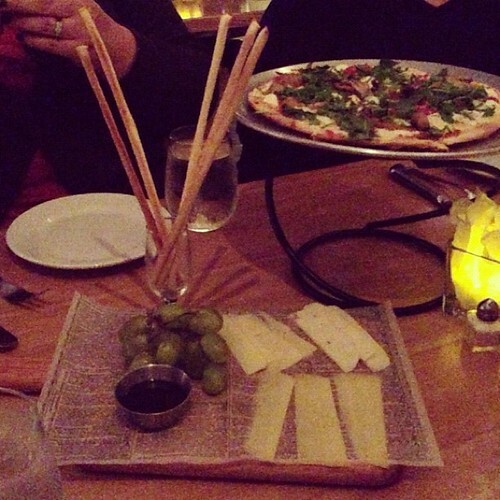 We started with some fresh bread, a killer cheese platter, and a flatbread pizza topped with prosciutto and arugula. The cheese plate was gone is approximately 5 seconds, and the blueberry honey that accompanied the cheese was beyond delicious. For my entree, I had the crab cake with parmesan truffle fries (I'll be sharing a recipe for these very soon!). The atmosphere of the restaurant was perfect for our girls' night out - quiet enough to hear each other talk, but not so quiet that we caused a ruckus or anything. We opted to wait on dessert, and headed to our next stop: The Pumpkin Blaze! When Tara mentioned going to this as an option for the weekend, I really had no idea what to expect. But here's the gist: in honor of Halloween and the nearby town of Sleepy Hollow, a bunch of local artists carve a crap-ton of pumpkins into amazing jack-o-lanterns. I can't even really do it justice by trying to describe it, but it was so amazing to see these works of art. 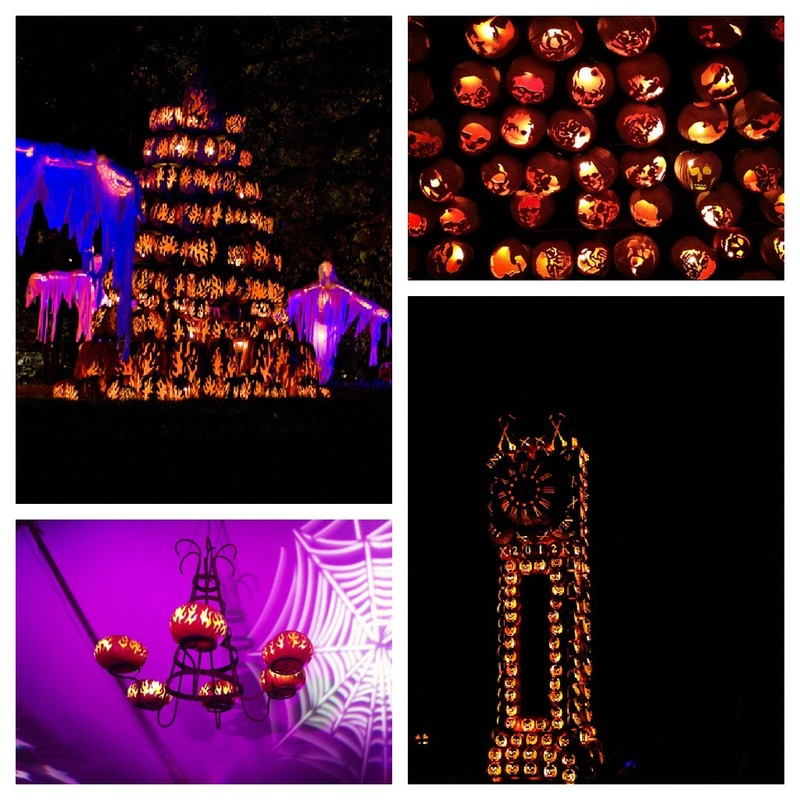 Thousands upon thousands of incredible jack-o-lanterns. 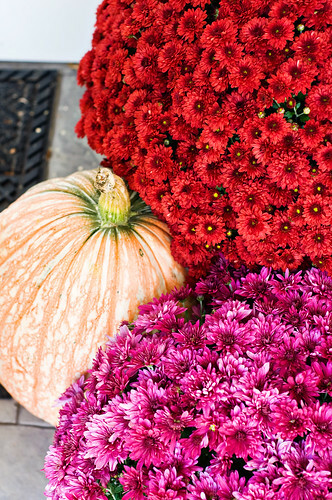 If you are ever in the Hudson Valley area during October, I highly recommend going. On our way home, we just so happened to drive past this sign, and we made Tara pull over so we could take pictures. Not that we're touristy or anything. And then we stopped for crepes, since we had foregone dessert earlier in the evening. 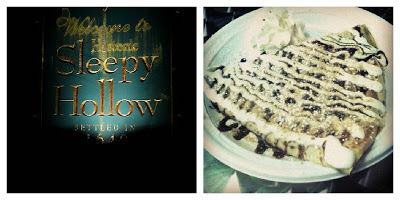 S'mores crepe. Enough said. The next day, we were up early to head to New Haven. It just so happened that were were in Connecticut the same weekend as Cupcake Camp New Haven! Of course we had to take advantage of the opportunity to stuff our faces with dozens of cupcakes. I'll call it an R&D mission for the blog ;-). There were tons and tons of people there, but we managed to come away with quite the haul. We grabbed a table at BAR, and dug in. 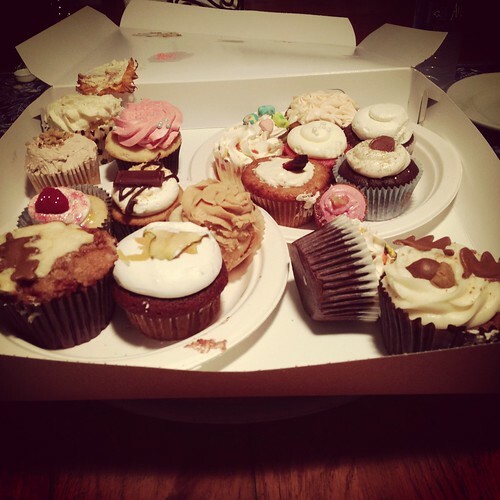 We tasted several awesome cupcakes, some decent ones, and sadly, some not-so-awesome ones. After eating more than I thought possible, we ordered two pizzas for the table: garlic mashed potato with bacon and cheese, and Italian sausage with roasted red peppers and basil. You know, to keep it nice and light. Yum all-around. 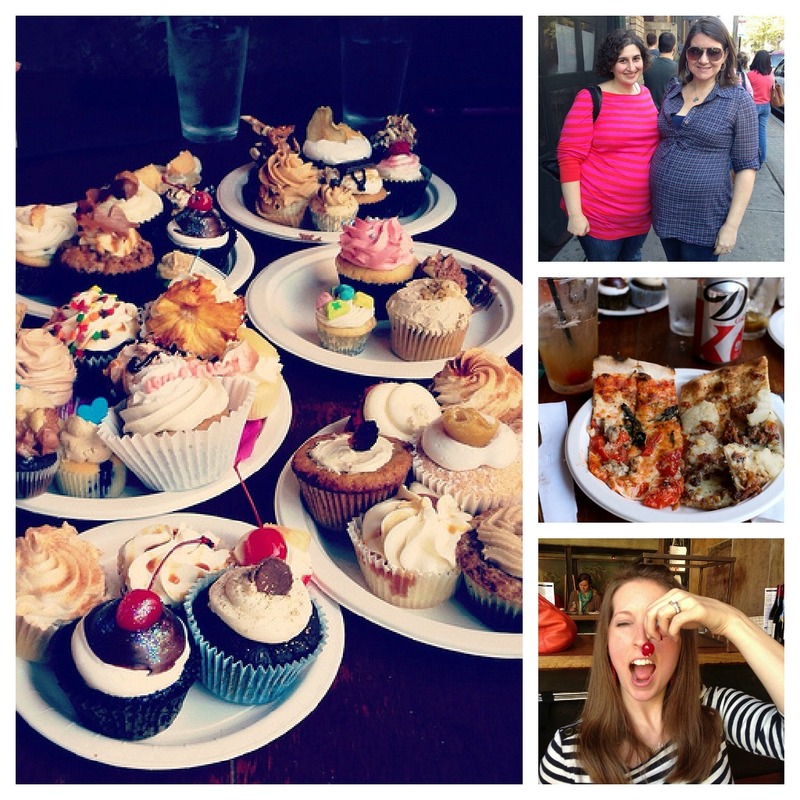 And then we ate more cupcakes. 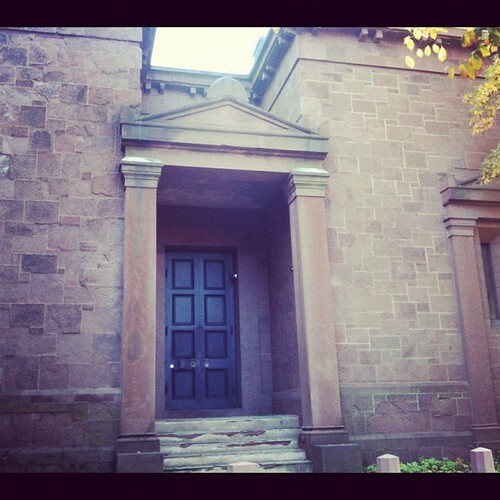 Following our gluttonous morning, Tara gave us a tour of the Yale campus. Hello, gorgeous. While I think Georgia Tech's campus is very pretty in an urban kind of way, Yale's campus looks like it was straight of out a movie. Which it is. Because she also drove us past the Skull House. Love that movie! That afternoon, we sat outside on Tara's perfect front porch, poring over cookbooks, blogs, and our Pinterest boards for dinner inspiration. 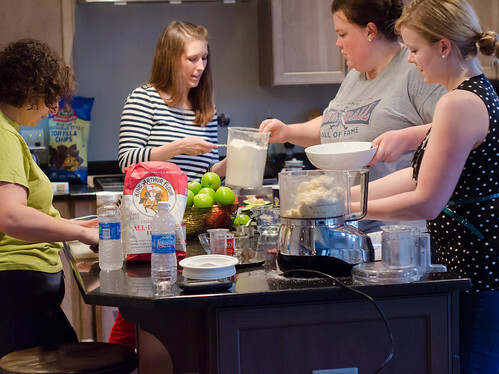 We couldn't possibly all get together and NOT cook. So we planned our menu and headed to the grocery store. We started with guacamole and caramelized onion and chorizo dip. Umm, perfection. And Annie gave us a demonstration on making homemade tortillas. Never going back to store-bought again. I basically sat at the bar and chatted and took a few pictures while everyone else did all the work :). Our main dish was roasted shrimp enchiladas with jalapeño cream sauce. Yes, pretty awesome. And for dessert, we finished off the rest of the cupcakes from earlier. Maternity pants were a beautiful thing that weekend. 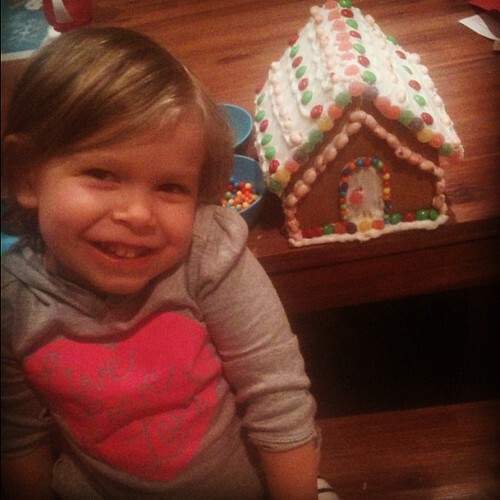 As much fun as we had at the Pumpkin Blaze and Cupcake Camp, that night was definitely the highlight of the trip for me. I laughed so hard that I thought I was going to go into early labor, and I'm not even exaggerating when I say that my abs were sore the next day. And since we so rarely get to all hang out, it was so much fun to spend so much quality time together. The next morning we headed back to the airport, and after sad farewells, we all went our separate ways. Since I had a few hours to kill before my flight, I did a little shopping and had some lunch. I couldn't possibly leave New England without having any clam chowder, so I enjoyed a nice comforting bowl before flying home. Even though this is about the longest post in the history of blogging, I still feel like I can't convey how awesome our weekend was. The weekend was such a whirlwind, and at the end I definitely wished we could have extended it a few more days. 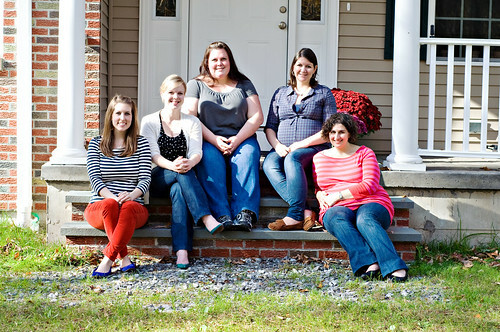 Thank you again, Tara, for opening up your house to us for the weekend. And tell Kyle and Wilma we're sorry for being so loud! !